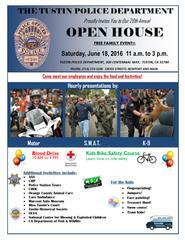 The public is invited to attend the 20th Annual Tustin Police Department Open House on Saturday, June 18, 2016. The free event will take place from 11:00 a.m. to 3:00 p.m. at the Tustin Police Department, 300 Centennial Way. Several police displays, including various Police Department vehicles, will be on hand. 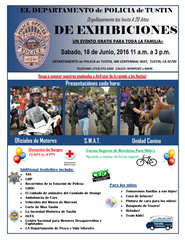 Tours of the Police Department will also be available and the event will showcase demonstrations by the Tustin Police Department K-9 team, Motorcycle Officers, S.W.A.T., and the Orange County Fire Authority. Children can enjoy free face painting, a treasure hunt, jumpers, and balloon hats. If your child wishes to participate in the “Kids Bike Safety Course,” please have then bring their bike and helmet. TPD Officers will be barbequing a delicious, free hot dog lunch. Several food trucks will also be present for those who wish to purchase their own food. There will also be several other exhibits and information booths from various public and private organizations offering valuable information. This year’s event promises more exhibits than in years’ past! The American Red Cross will be holding a Blood Drive from 10:00 a.m. until 4:00 p.m. in the Clifton C. Miller Community Center at our same location. We encourage the community to attend the TPD Open House to find out more about their Police Department and how we can work together to be a safer community. Open House will provide a day of education, entertainment, food, and fun!